[By Nick, New for 2013, discontinued before 2016] As the unofficial residential gelato expert here at On Second Scoop (I mean come on, my last name is Rovazzini and all) it was only a matter of time until I tried out Haagen-Dazs' latest endeavor into the world of gelato. To be honest, after Dubba reviewed the flavors that sounded the best, I really wasn't interested in trying the remaining flavors. The fruity ones both contain alcohol and we know HaagenDazs doesn't mess around when it comes to booze. So that leaves me with just their Cappuccino gelato. I've already tried G.S. Gelato's Tiramisu and more recently Ciao Bella’s Triple Espresso both of which I’d consider to be outstanding coffee gelatos. Let's see just how Haagen-Dazs stands up to its competition. I really like the design of these faux-pints. Like their violet colored limited edition pints, there’s just a feel of sophistication as well as simplicity. So what exactly is this flavor made up of? 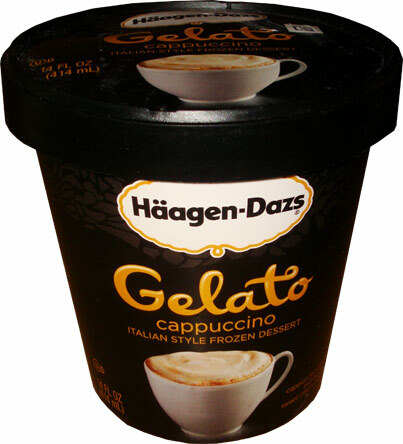 Well Haagen-Dazs describes it as “bold and complex, our cappuccino gelato beautifully blends cappuccino and sweet cream gelato.” Wait, shouldn’t it be coffee gelato blended with sweet cream gelato in turn creating a cappuccino gelato? If not, then shouldn’t the name be cappuccino sweet cream gelato? This is actually really bugging me. I know it’s just a description but I'd prefer it to actually make some sense. Okay well that filled my rant quota for the week, let's move on to the actual product shall we? Digging down to a better view, it seems to be a pretty even ratio of gelatos with the possibility of there being a slight bit more of the sweet cream. Since it’s quite easy to distinguish the two from one another, I’m able to sample both bases before combining them. 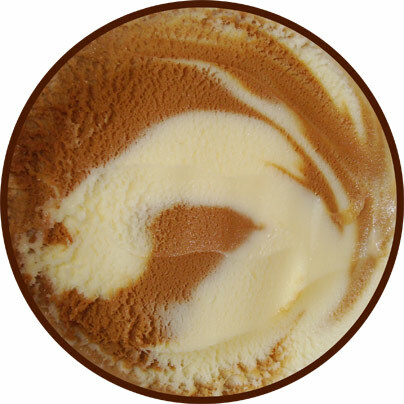 The sweet cream gelato is reminiscent of their sweet cream ice cream they use is their Salted Caramel Truffle. The cappuccino gelato on the other hand tastes off. While I enjoy Haagen-Dazs standard Coffee ice cream, this just seems watered down and lacks that punch I associate with coffee flavors. There’s also some weird aftertaste going on. I’m not sure what it is but I’m sure a more experienced coffee drinker could point it out to me. Mixing the two together doesn’t help out the situation and possibly makes it worse. The coffee flavor becomes even tamer and just plain boring. That aftertaste lessens but it’s still noticeable. While I could eat spoonful after spoonful of G.S. or Ciao Bella, I can’t do that with this one. Now let’s talk about the consistency. Haagen-Dazs calling this product gelato is a stretch. To be honest, this just reminds me of a smoother version of their normal ice cream, much like the retired 5 line. While I prefer this texture to their normal stuff, this isn’t authentic gelato like they want you to believe. The ice cream itself looks amazing it's disappointing to hear that the taste is lacking. I love coffee flavored ice creams are there any recommendations out there? @Roy: If you're looking for a base only flavor, I'd go with either of those two gelatos I mentioned in the beginning of the review. If you can't find them, Haagen-Dazs normal coffee ice cream is really good and Stoyfield's Gotta Have Java is great especially seeing as it's a froyo. If you're looking for mix-ins, you can't go wrong with any of the coffee flavors Ben & Jerry's offers especially their "new" Coffee Coffee, BuzzBuzzBuzz!. Sorry to read you didn't like it. I think this is really sweet tasting and not as bitter as other coffee ice creams. This is my favorite coffee flavored ice cream/gelato. Yet, I rarely buy it because Gotta Have Java frozen yogurt by Stonyfield is a tad better. @Stride: I would say stonyfield is leaps and bounds better than this one. There's just something off I can't quite put my finger on. Do you have any other coffee flavor recommendations? I think Haagen-Dazs's coffee ice cream is has a weaker coffee flavor so I'm surprised you liked it. Can you review a Starbuck's cream. I am interested in the differences between their Mocha Frappuccino, Caramel Macchiato, and Coffee ice creams. Also, Rice Dream has a Cappuccino Swirl flavor that I was interested in, too. I hope some of these ideas are helpful. There are way too many ice cream flavors out there to ever run of samplers! @Stride: Starbucks actually discontinued their ice cream line in favor of greek yogurt parfaits. 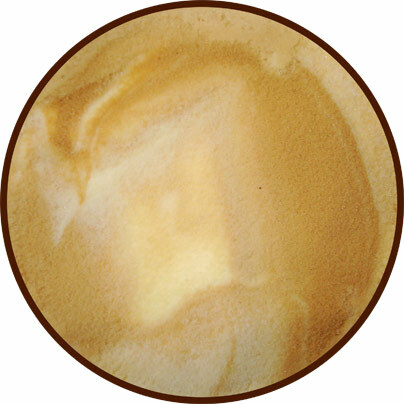 I do have a review of the caramel macchiato one I'm going to put up in the near future as a sort of "goodbye" post. I still see pints of Starbucks ice cream at my grocery stores. I guess these are the last of them? I love Starbucks coffee ice-cream. I tried Hagen-Daz when I couldn't get Starbucks and I don't care for it. It tastes like a bland sweet coffee, to me. It's missing a lot of what Starbucks had to offer. Starbucks is rich, but not too rich, and not too sweet- just lots of flavor with a lot of depth. I always bought their Java Chip Frappucino that had plenty of good sized chunks of dark chocolate that easily melt in your mouth. @Angela: Not sure if you saw but Starbucks has stopped producing ice cream. I actually like Haagen-Dazs normal coffee ice cream. This gelato on the other hand was just off. Are you sure Starbucks ice cream has been discontinued? I just saw some (and almost bought it) yesterday. Pint size containers. @Anon: yeah, they had a big announcement about it. I've still seen a few places selling off their remaining inventory. It was never a big seller so what remains has been slow to move off shelves.